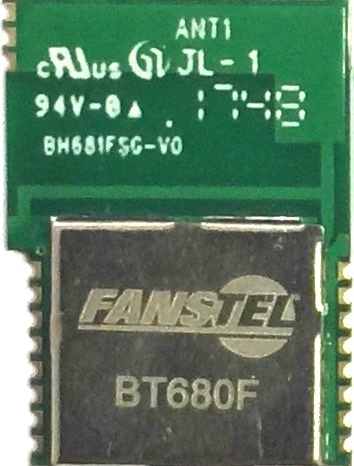 BT680E uses Toshiba TC35680 SoCs. An u.FL connector is on board for external antenna. A host MCU can control module with HCI commands through UART interface. Standalone mode is supported with on-board flash. BT680F: User’s application is stored in on-board flash and loaded into on-board RAM at booting-up for standalone operation. Fanstel’s AT command code is preloaded for legacy MCUs to upgrade to Bluetooth 5 features and longer range. Or, user can load other application codes. BT680E offers the same features as BT680F. An u.FL connector for external antenna is installed instead of the integrated PCB trace antenna in BT680F. BT680T operates in automobile temperature range. A host MCU sends HCI commands over UART interface to control module. With an external serial EEPROM, BT680T can operate in standalone mode. BT680K offers the same features as BT680T except working in industrial, not automobile temperature range. 2X bandwidth to support 2Mbps data rate. 4X range to provide coverage of an entire home or building. 8X broadcasting message length from 31 bytes to 255 bytes. Bluetooth SIG CORE_v5.0 LE CODED PHY uses FEC (Forward Error Correction) codes, 8 or 2 symbols to represent 1 data bit, and 1 M Symbols per second (MSps) transmission rate. Effectively, the maximum data rate is 125 kbps when 8 symbols are used. This FEC coding allows receivers to receive much weaker signals and to increase range by 4 times. BT680E with Bluetooth mesh stacks can be used with available WiFi to BLE gateway or BLE 5 USB dongle to connect to an IoT Cloud server. Bluetooth SIG certified BLE 5 stacks embedded in mask-ROM. Bluetooth range: 900 meters at 125 Kbps, estimated. Bluetooth range: 450 meters at 1Mbps, estimated. Bluetooth Low Energy (BLE) V5 GATT profile with OTA (Over The Air) support. Up to 6 ADC channels (1 for internal monitoring of VDD). Hybrid Castellated and LGA, 40 pins: pins. Easier prototyping, easier production. For volume discount and production lead time, please email Fanstel.